Catching drills for playing catcher includes vital tips on blocking & throwing. Catching drills for baseball catchers center around the big three skills that youth league catchers need the most. 3. Blocking the ball in the dirt.Now there are many more skills and drills that help coach the catcher position like: fielding bunts, tag plays at home plate, catching pop flies, making throws to the pitcher on short passed balls and wild pitches. By far the largest majority of catching drills should focus on the Big 3. How to find and what to look for in a catcher. To play catcher well one has to defend and prevent runners from reaching scoring position. Good top catchers will make it difficult for the opponents to reach scoring position. The best catchers can effectively block the pitches in the dirt and keep runners from advancing when pitchers bounce the off speed pitches. The baseball catcher can catch the ball from the pitchers. Rarely does a catcher allow for passed balls for runners to advance so easily. The catchers stance is often overlooked as an important component of the catcher position. The proper catcher stance takes a lot of work and most catchers are not willing to strain the leg muscles in order to use the stance to their advantage. 1. 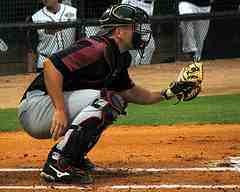 The catchers stance should start with the legs twice shoulder width with the toes slightly pointed outward. 2. The back should be mostly flat kind of like the downhill skier. 3. The rear end should be up off the ground. If the catcher utilizes the correct catching stance they will dramatically increase their range on blocking balls in the dirt and be in a readiness position to be able to start the catcher throwing footwork on almost any pitch by the pitcher. Unfortunately, for the sake of comfort, too many catchers keep their feet too close together, keep the back more vertical and allow the rear end to drop too low. Some even give in to using ‘knee savers’. Thus=decreasing blocking range, overall readiness, and the ability to quickly perform throwing footwork on all pitches. To play catcher blocking the ball must become like a routine play. Catchers should welcome and look forward to blocking pitches in the dirt and performing catching drills. 1. DO NOT try to ‘catch’ the ball in the dirt unless the ball can be caught on the short-hop next to the glove. Otherwise you are playing with danger likely getting lucky snagging a few here and there. Mostly, it is too risky to try and catch the ball in the dirt. Eventually the risk will find its way by you and you will be running back to the backstop too often. 2. Anticipate the ball will be in the dirt any time an off-speed pitch is called for when the catcher puts down the baseball signs. It is often difficult to block the fastball in the dirt. The fastball pitch is faster so a catcher will have less time to react and the pitch is rarely in the dirt anyway. Off speed pitches are a different story.Curveballs and change-ups are supposed to be low in the strike zone so be ready to block them. 3. Put most of your weight on your left foot and be ready to move to your right on a right handed pitchers curve ball. Vice versa for a lefthand pitcher. The best catching drills I have ever seen for catchers blocking drills was when I was in college at Fresno State. Bob Bennett was my college coach and is in the NCAA college baseball coaches Hall of Fame. 1. During the catching drills he would use 2 baseballs. He would have one himself and another catcher would be standing nearby with the second baseball. 2. He would be about half way to 3/4s of the normal regulation pitching distance. 3. The first catcher would get into the catching stance at home plate. 4. 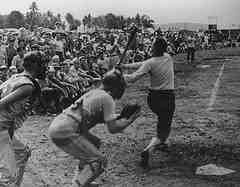 Coach Bennett would begin tossing balls in the dirt rather easily in front of the catcher. 5. The catcher had to block the ball as long as the ball stayed in front or to the side they could stay in the drill. 6. The catcher had to bounce up and retrieve the ball before it stopped rolling or they were ‘out’ of the drill. 7. 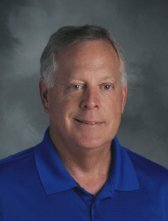 Once the catcher blocked the pitch and bounced up and pounced on it they tossed the ball back to the shagger guy next to Coach Bennett. 8. Immediately if not sooner the catcher had to scramble back to the catchers box because Coach Bennett was already cranking out the second ball in the dirt. 9. That is why I call it the Suicide Catching Drills for Blocking. Coach Bennett was working two baseballs all the time so you were in a mad scramble to block it, go get it, throw it to the shagger and quickly return to the homeplate position and do it again. 10. There was no resting or lollygagging involved in the drill. You could not stop and lick your wounds. It was perpetual constant motion and scrambling to stay alive. 11. If the ball stopped rolling or went behind you, you were done and had to go to the back of the line. I think I had a short-lived record for a while with like 52 successful blocks. Ya, I was pretty much exhausted. 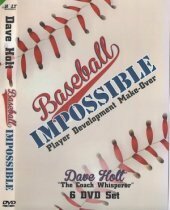 Coach would start increasing the difficulty throwing the pitches wider from side to side as you stayed in the drill longer. The point is if you can block the ball consistently over and over at this up-tempo drill speed then blocking the ball in the ball game seemed like a simple routine play. Catching drills for blocking pitches are easy to do. Do them over and over and your catchers will get better and help keep the opposition from getting into scoring position as often.